Amino functionalized magnetic silica beads have the same structure as silica coated magnetic beads. It is also with typical core shell structure. The core is superparamagnetic Fe3O4 nanospheres which are coated with silica layer as shell. Amino groups are from surface modification by KH550. Besides amino groups, there are still some –SiOH groups left on the surface. 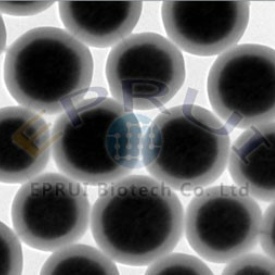 Therefore, amino functionalized magnetic silica beads are not suitable for separation and purification of protein as well as other biomacromolecule. Good storage stability: complete silica coating, stable performance, resistance to 6M hydrochloric acid etching > 5 minutes.